Whether you’re gazing out over a never-ending sea, billowing plains, or treacherous mountain terrain, it’s impossible not to feel small as the vastness of the planet envelops you. But we always have to remember the power that we have together, and that’s exactly what this issue of Compass reminds us. In this issue of Compass, come with us, as we explore the depths of the Weddell Sea in Antarctica and make the case stronger for creating an Antarctic Ocean Sanctuary with new science. If created, the sanctuary, will be the largest marine protected area in the world, a safe haven for whales, penguins, and seals, and designated off-limits to companies depleting Antarctic waters of its ecosystem’s heart, the krill almost every animal there forages on. 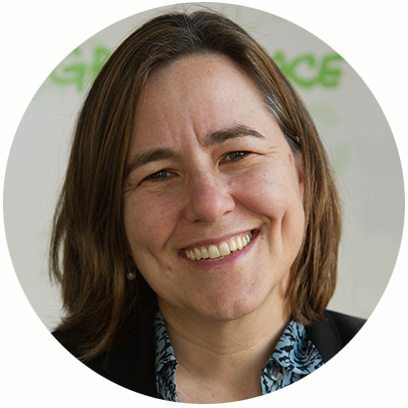 Take a deep dive into Greenpeace’s work to change the conversation on what climate action looks like and to push California’s governor to be a real climate leader by stopping the expansion of oil and gas drilling in the state. And join us in victory, with Kinder Morgan now backing off from its Trans Mountain pipeline expansion because of mass demonstrations against the project. It is with greatest pride that Greenpeace supports the Indigenous-led movement and celebrates this latest victory for First Nations and our climate, water, and wildlife. Creating an Antarctic Ocean Sanctuary, raising the bar on what real climate leadership looks like, and convincing big companies like Kinder Morgan to put people and the planet before oil profits are not hopeless, lofty dreams. 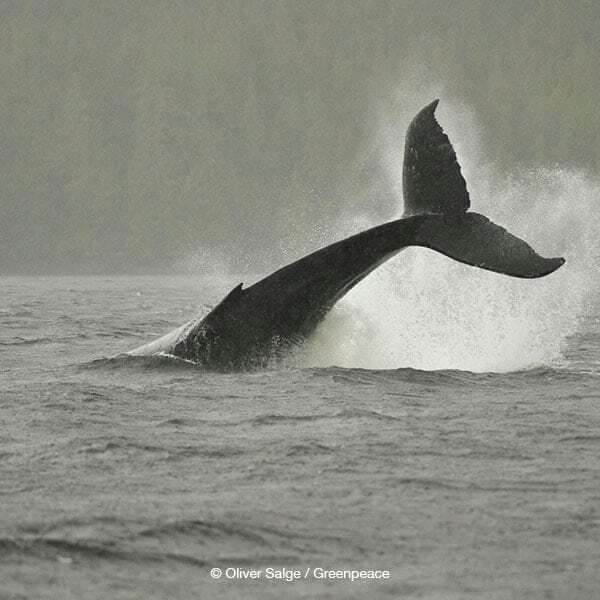 They’re achievable goals—and within reach, thanks to your generous support of Greenpeace. Though the world is vast and, individually, we may be just smaller pieces of a greater picture, time and time again, you help us prove that people power works. It may sometimes seem impossible until it’s done, but your partnership always helps us stay the course. Thank you! 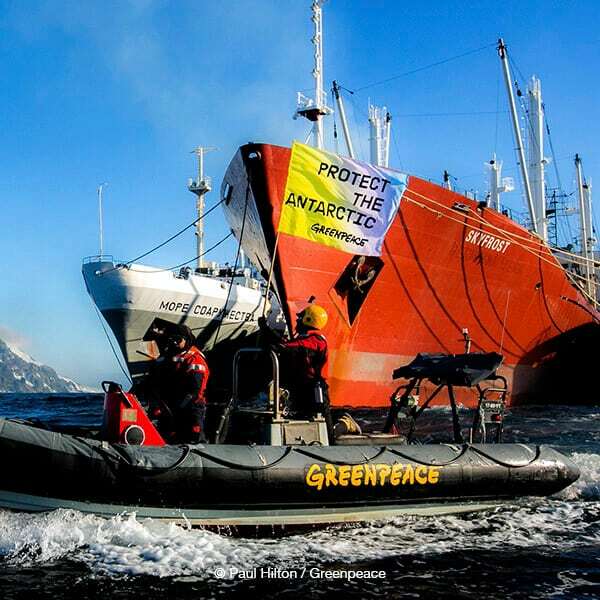 Early this year, the Greenpeace ship, the Arctic Sunrise, arrived in Antarctica for a three-month expedition to an extraordinary place beyond imagination. It was a journey of hope and adventure—and determination, because we have a very real chance in 2018 to create an Antarctic Ocean Sanctuary. At 695,000 square miles, it will be the largest marine protected area on earth, and its waters will be off-limits to an expanding krill-fishing industry sucking up the tiny shrimp-like creatures on which nearly all Antarctic life depends, including whales, penguins, and seals. What a thrill it was to explore what’s hidden in the dark depths on the seafloor, to see firsthand and up close the rich, colorful garden of ocean life and how the creatures interact in their natural environment—and to watch creatures many scientists have never before seen alive. Spectacular gardens of corals, sponges, anemones, and brittle stars. Dancing feather stars, enormous sea spiders with spindly legs, and “disco jellies” and “comb jellies” flashing with colorful bioluminescence to attract tiny prey into their sticky tentacles. In a phenomenon that has been described as the Rise of Slime, gelatinous creatures like ctenophores, salps, and jellyfish appear to be increasing in numbers due to overfishing of their predators and warming waters. This can create a dangerous feedback loop, as they eat the larvae and eggs of already-depleted fish. It is too cold for most fish on the seafloor, but we saw crocodile icefish, a species that has an anti-freeze in their blood, on every dive, and they’re quite fascinating and really fun to watch. We saw one that had apparently swallowed another icefish whole, with just the tail sticking out of its mouth. Another swam right at us with its mouth gaping menacingly. This fish must be used to being able to eat just about anything it sees move, and we imagined its confusion as it realized how big our submarine was compared to anything it had ever seen before. 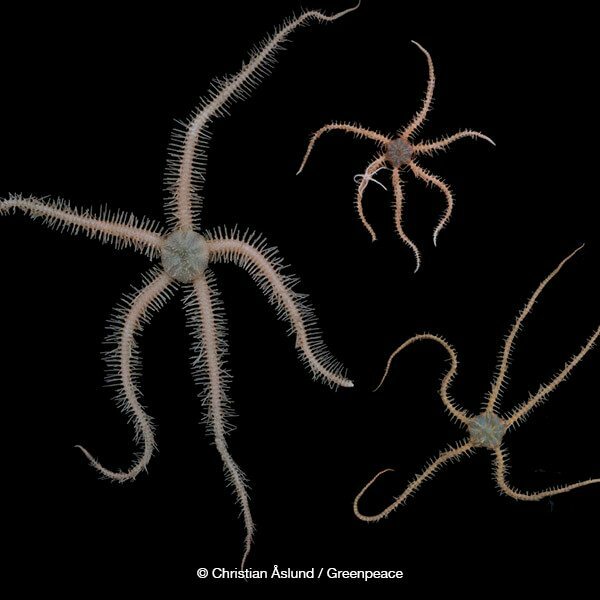 The seafloor of the Antarctic Ocean is a great place for spiny-skinned echinoderms. The group includes sea stars and their relatives, and they have A LOT of relatives down here. Wily brittle stars crawl quickly across the bottom, eating detritus as they go. Giant predatory sun stars (that might be better named “death stars”) always seemed to be devouring something when we saw them. Urchins, feather stars, and bright red sea stars were common sights on our dives. Sea cucumbers–attached, crawling, and even swimming varieties–were always around, quietly and efficiently eating the marine snow that slowly settles down from the waters above. But perhaps the best thing we found was what we didn’t see. While the shallow areas are periodically scraped clean by glaciers and giant icebergs, the deeper regions we visited were lush and pristine. In comparison to other coastal waters, very little of the Southern Ocean has ever been fished. 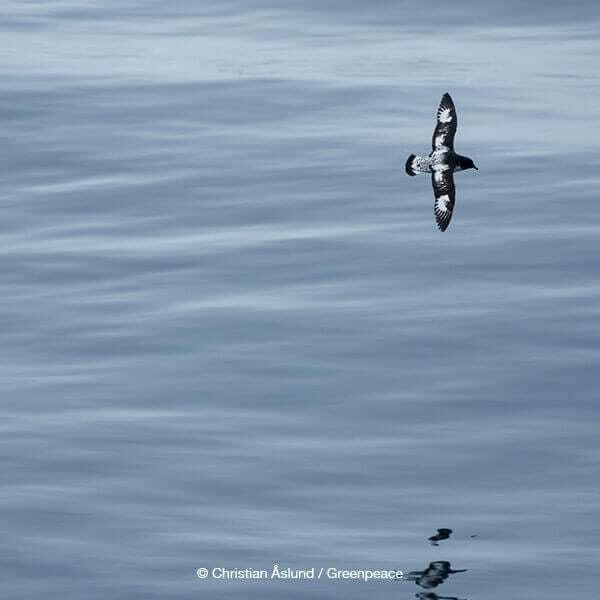 None of the initial micro-plastic surveys we have conducted so far in Antarctic waters turned up any plastic particles, an encouraging and striking difference from what we have seen elsewhere. It’s not too late to save this spectacular, wondrous place! 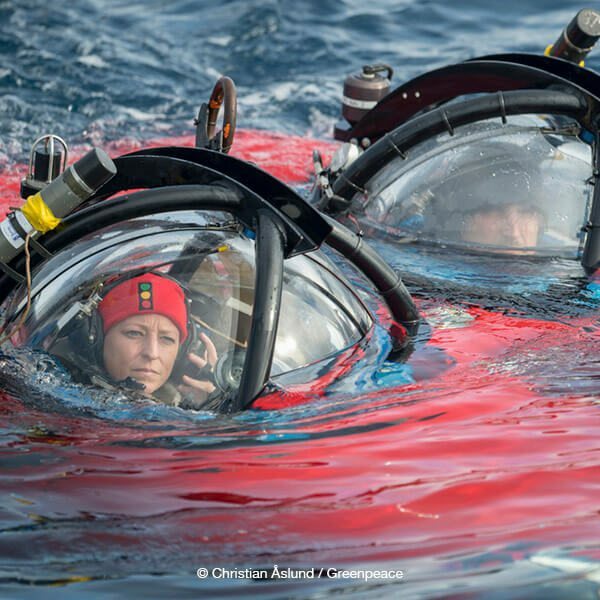 Each time we dropped down in the two-person submarine we never knew what we’d see 2,000 feet below at the bottom of the sea. Most of what is known about Antarctic marine life at the seafloor comes from what was pulled up in trawl surveys or fishing gear. 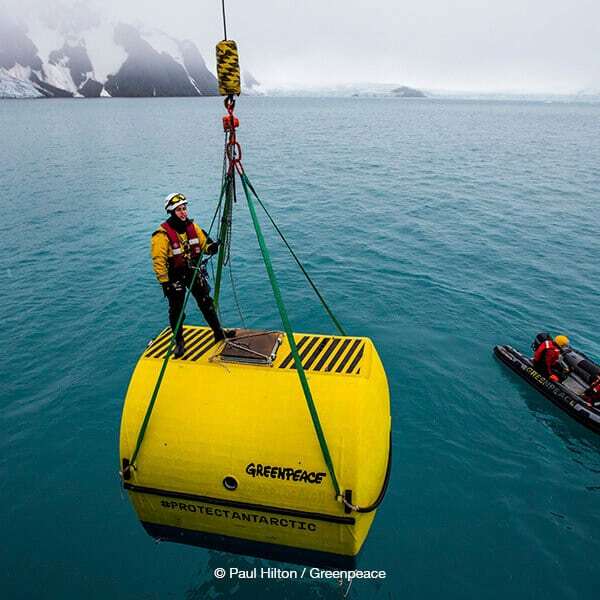 Instead of causing destruction for the sake of science, Greenpeace’s submarine-based research allows us to softly and non-invasively glide above the bottom. The sub is equipped with powerful lights so we can see in the darkest ocean depths where no sunlight can penetrate, and film what we find in high-definition images to show the world what is at stake. Once we get back on shore, the real analysis began—identifying the more mysterious creatures we encountered, going through the video data and quantifying the relative abundance of what we saw, and sharing our results with the Commission for Conservation of Antarctic Marine Living Resources. This scientific work is important for providing a strong foundation for the Antarctic Ocean Sanctuary proposal the Commission will consider later this year in October, but it is equally important that people around the world join together in calling for protection for this unique and wonderful place. Greenpeace tracked the activities of the little-known krill fishing industry in the Antarctic over the last five years, and, in a new report, exposes the environmental risks of this fast-growing industry in one of the world’s most pristine regions. This fishing industry is targeting tiny shrimp-like krill—one of the most important species in the Antarctic food web, eaten by everything from blue whales to Adélie penguins—to be sold in products such as krill oil and Omega-3 tablets, as well as fishmeal for farmed fish and even pet food. But despite presenting itself as one of the best managed fisheries in the world, Greenpeace’s investigation reveals a different picture. Intensive fishing taking place in the immediate vicinity of feeding grounds of Antarctic wildlife such as whales and penguins, creating direct competition for food. 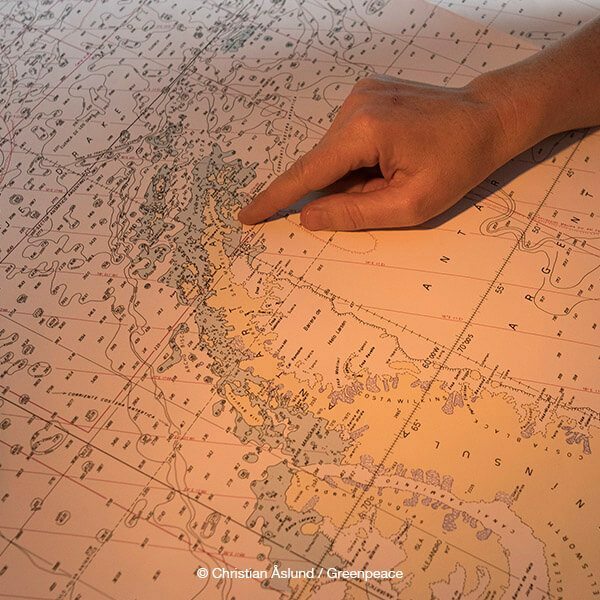 Tracking data suggests vessels have anchored close to specially protected areas, despite the potential impact on wildlife and the seafloor. Activities suggesting risky fishing practices such as transshipment (the transfer of catch to huge refrigerated vessels), with long lists of previous infringements, including poor safety records and low standards in pollution prevention from both sewage and oil. Transshipment globally has often been linked to environmental and labor rights abuses due to the lack of transparency it allows. The potentially devastating impact of fuel spills, fires, and groundings from these vessels in pristine Antarctic waters. Greenpeace is calling on the krill fishing industry to immediately cease all fishing activities in areas under consideration for protection by the Commission for the Conservation of Antarctic Marine Living Resources and for all businesses buying krill-derived products to stop sourcing from vessels that continue to fish in these same areas. BHP Billiton is abandoning plans to drill for oil near a huge coral reef in the mouth of the Amazon River. 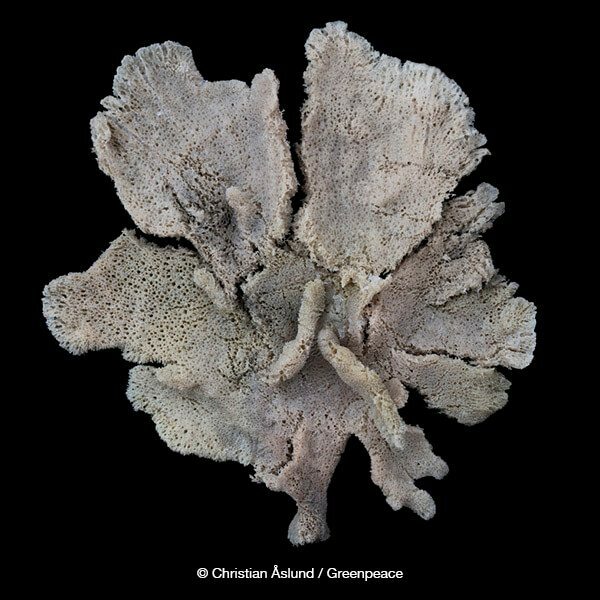 Thanks to data Greenpeace gathered during the Esperanza’s first expedition last year when we were able to show the Amazon Reef to the world for the very first time, we were able to provide scientific evidence proving the risks of oil drilling. We could be in front of one of the biggest and most mysterious ecosystems in the world. More than 1.8 million people worldwide signed our petition to Save the Reef and the Brazilian authorities cancelled the 2018 bidding round for permits to drill close to the reef. But even knowing that this unique ecosystem will suffer devastating consequences if an oil spill happens, the fossil fuel industry isn’t giving up. The Esperanza returned to the Amazon on a second expedition for more exploration and submarine dives, and discovered that the Amazon Reef extends into the areas where French oil giant Total planned to drill. This new evidence adds powerful new momentum to our efforts to stop oil drilling from being permitted near this incredible reef. The Chinese Ministry of Agriculture cancelled the distant water fishing permits of three Chinese companies engaged in illegal, unreported, and unregulated fishing. Vessels from all three companies were arrested during a joint patrol between Greenpeace and local fisheries inspectors. Greenpeace handed over illegal nets and evidence of shark finning and fishing without a license to West African and Chinese authorities. China is now taking measures to restrict 2,900 distant water fishing vessels’ activities in their main fishing grounds. 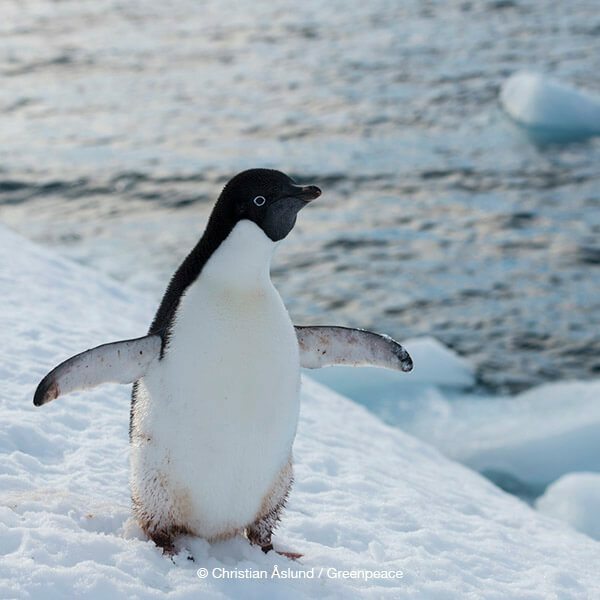 After just a few days of hungry penguin stickers appearing on the company’s krill products and more than 45,000 emails to their CEO in 24 hours, international health food chain retailer Holland & Barrett was moved to take action. The company announced its decision to “remove all krill-based products from sale in the coming weeks in line with the recent Greenpeace report that calls for limiting fishing for krill in areas proposed for new Ocean Sanctuaries.” Greenpeace has confirmed with the company that none of the 1,300 Holland & Barrett stores globally will re-order any of these products, sending a strong signal to the krill companies, especially in regions where the industry is targeting rapid growth, that public demand lies with Antarctic protection, not exploitation. Canadian logging company Resolute Forest Products filed its response to Greenpeace’s motions to dismiss the company’s amended lawsuit in a multi-million-dollar racketeering case. The amended complaint is a repackaged version of Resolute’s claims against forests defenders and environmental organizations that was dismissed in federal court in October 2017. The sole purpose of this lawsuit is to silence those who have raised their concerns about Resolute’s environmental practices in the Boreal forest. Greenpeace remains confident that this repackaged version of the case will ultimately meet the same fate of its unsuccessful predecessor. 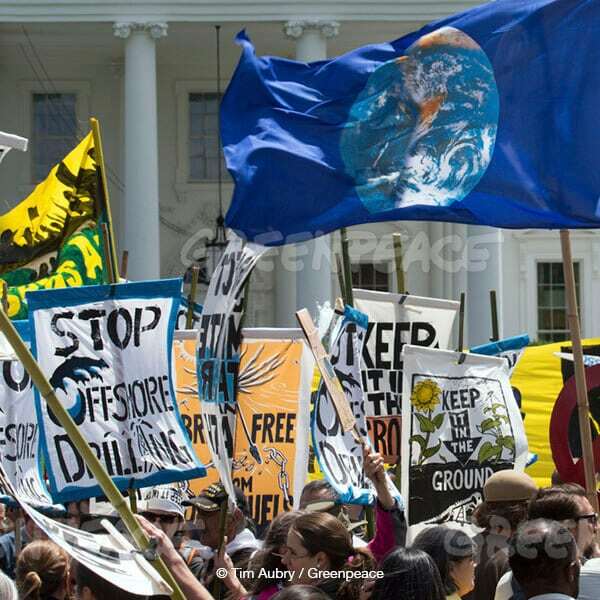 In the lawsuit against Greenpeace brought by Energy Transfer Partners, the corporation behind the Dakota Access Pipeline, admitted in a recent filing that what really bothers the company is the strength of collective voices seeking to hold it accountable. Companies like Energy Transfer Partners need to understand once and for all that they remain accountable for any of their actions affecting communities and the planet. The First Amendment gives people the right to raise our legitimate concerns when we perceive abuse of power—the same First Amendment rights that the Indigenous-led movement at Standing Rock employed to resist and bring attention to ETP’s disregard of their rights. That’s democracy working at its finest. Opposition from the public should be protected by our courts when corporations engage in extreme wrongdoings. An attempt to abuse the legal system with a baseless Strategic Lawsuit Against Public Participation (SLAPP) is one of the most recent examples of corporate overreach by Energy Transfer Partners. However, it is not the only threat. Oil companies and industry front groups are doing everything they can to pass state bills that will make it harder to oppose their plans to expand pipelines. The images and stories from Standing Rock are a stark reminder of what Energy Transfer Partners and its mercenaries are ready to do to stand in the way of peaceful resistance. 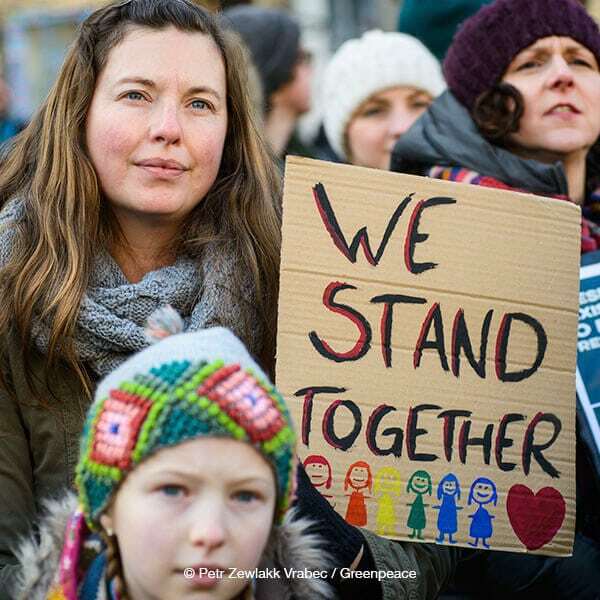 Corporate harassment against individuals needs to stop now, and Greenpeace will not be silenced and we will not back down. On December 28, the Russian Government signed a decree on the establishment of the Ladoga Skerries National Park, one of the largest protected national parks in the whole of Europe. The work to protect the unique natural areas has been going on for 27 years and, finally, resulted in victory! Ladoga skerries consist of large rocky islands covered with forest, and small islands polished with waves. It is a unique natural complex of the Republic of Karelia. “Schera” in Swedish means “rocks in the sea.” Eagles and Ladoga ringed seals, which are included on the International Union for Conservation of Nature Red List of Threatened Species, live here. The total area of the new national park is more than 470 square miles. In the next two to three years, the land will be developed, various departments and services will be created, and eco hike trails for tourists will be established. Greenpeace Russia helped with the establishment of this national park and protection of natural areas on Ladoga islands. We investigated and promoted the inclusion of valuable territories in the park boundaries, and searched for and documented at-risk species. We also negotiated with loggers, advocated for the creation of these reserve areas, and fought human-caused wildfires. Since 2008, alongside volunteer forest firefighters, Greenpeace activists have been organizing an annual firefighting camp on Ladoga and helping to patrol the territory. In ten years of our work during the tourist season on the islands, we had extinguished 80 forest fires. In 2016 several companies, including Rosneft, Russia’s leading fossil-fuel giant, lobbied for exclusion of valuable lands from the planned territory of the park, and for the allocation of these lands for construction and economic use. But 40,000 people turned to the Minister of Natural Resources to object, and 40 scientists and 19 public organizations appealed to the president—and as a result, the borders of the future park remain intact. This victory, the establishment of the Ladoga Skerries National Park, was made possible only through the help of Greenpeace supporters. Thank you to all! A decade has passed since the Guinness World Records in 2008 awarded Indonesia the “highest rate” of deforestation on the planet, and yet we’re still seeing high rates of deforestation in Indonesia. This is a result of the rapid growth in the use of palm oil—an ingredient found in soaps, shampoos, cookies, chips, and makeup. It’s basically in everything and everywhere. Over the last 10 years, consumer companies like Unilever, Colgate Palmolive, and General Mills promised their customers that they would clean up the palm oil in their products by 2020—for the forest and the climate. However, with less than two years to go, forest destruction in Indonesia shows no sign of slowing down. Greenpeace’s new report, Moment of Truth, reveals that brands are not on track to keep their promise of a clean palm oil supply chain by 2020. The problem keeps getting bigger and the responsibility lies with the companies profiting from this destruction. In response, Greenpeace challenged 16 of the world’s leading brands to reveal where their palm oil comes from. Since the release of our report we now have 11 out of the 16 companies that have complied and three brands that continue to hide this information from the public. We’ve managed to shift corporate mindsets to disclose information that has been historically treated as confidential. With the release of the Moment of Truth report, Greenpeace has managed to increase visibility across supply chains by piercing the veil of transparency and the non-disclosure agreements between brands and suppliers of palm oil. As a result, brands are no longer able to pretend their palm oil is clean—the data shows not only that brands are still using palm oil from destructive palm oil producers but also the specific dirty producers each is sourcing from. What are the consequences of business as usual? Indonesia has more threatened and endangered species than any other country on Earth—largely due to the destruction of their habitats. The Bornean orangutan population has decreased by half since 1999, with over 100,000 lost in the last 16 years. In 2017, a new species of orangutan, the Tapanuli, was discovered on Sumatra and it’s already endangered. 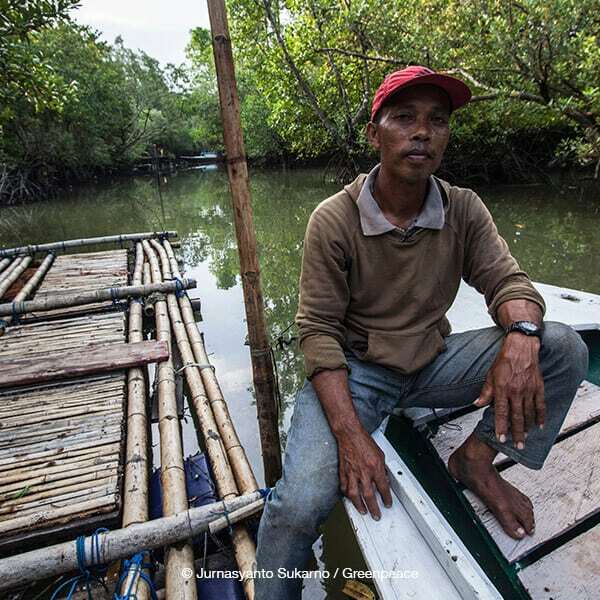 Around 24 million hectares of Indonesia’s rainforest were destroyed between 1990 and 2015. And since 2012, 146 football fields of rainforests have been lost every hour—that’s one football field every 25 seconds. There are still brands like Johnson & Johnson, Kraft-Heinz, and Smuckers that continue to keep this information in the dark and from the public. We must get brands to stick to their word and make sure that they don’t use palm oil that is made at the greatest cost: the rights of people, the lives of orangutans, our forests, and our climate. The commitment doesn’t start in 2020. It needs to start now. 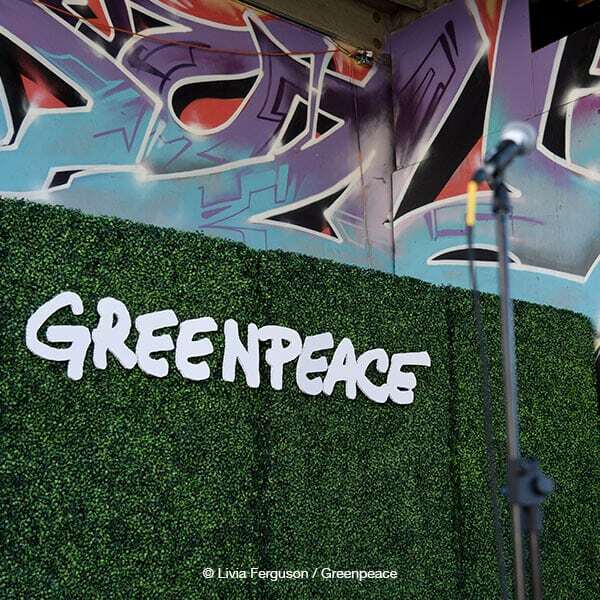 Backstage with Greenpeace—the Event of the Year! Held in April at our West Coast Action Center in Oakland, California, the 3rd Annual Backstage Gala provided an exciting behind the scenes look at what it takes to make Greenpeace so effective in our fight to save the planet. It was a chance to hear from esteemed event speakers and experience the action side of Greenpeace, with climbing demonstrations and the unfurling of a banner over the side of the event venue. Attendees had the opportunity to climb into Greenpeace’s hot air balloon basket, our Airship gondola, the rigid-inflatable boats, and our Greenpeace ambulance. They also experienced a real “lockdown,” and were able to use a lock box to experience true non-violent direct action. An evening not to be missed, every year Backstage with Greenpeace provides a chance to mingle with fellow members of the Greenpeace community and raise funds for the cause that unites us all—creating the green and peaceful future we all want to see for people and the planet. Find out more about this exciting event at greenpeacebackstage.org! 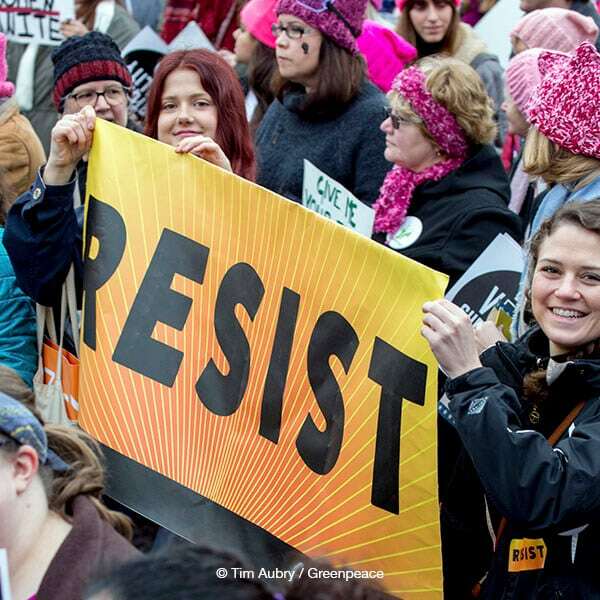 Greenpeace and our partner organizations across California saw a window of opportunity this year to raise expectations of what real climate leadership looks like among global elected officials. California’s outgoing governor, Jerry Brown, is often heralded as a climate hero, but dirty oil and gas extraction and refining in the state continues under his watch, creating ongoing public health problems for communities nearby and emitting significant carbon emissions. We’re joining forces with allies to pressure Governor Brown—and create a mandate for his successor—to halt the permits for oil and gas extraction and infrastructure as the start of a phaseout of fossil fuel production. This must happen as a just transition that protects industry workers and the communities most vulnerable to the impacts from fossil fuels. This campaign is building in the lead-up to the Global Climate Action Summit that Governor Brown is hosting in San Francisco in mid-September of this year. The global spotlight will be on Brown to demonstrate bold climate leadership, and as the fifth-largest economy in the world, California has the ability to shift the climate narrative globally and to raise the bar on what climate leadership looks like. People Power Prevails—a Huge Win for Our Climate, Our Communities, and Indigenous Sovereignty! After a wave of mass demonstrations in March, Kinder Morgan announced in April it is putting its Trans Mountain Pipeline expansion on life support and may kill the project altogether. If built, this pipeline would ship almost one million barrels of tar sands oil, one of the world’s dirtiest sources of oil, every day from Canada’s interior into the Pacific Northwest. This and other pipeline projects risk water supplies, threaten Indigenous human rights, and endanger all of us by intensifying the climate crisis. And if Kinder Morgan goes through with the pipeline expansion, giant oil tankers would ship the dirty fuel through an endangered orca habitat every day for the next 50 years. Indigenous land defenders are leading the resistance to tar sands pipelines. In solidarity with the more than 150 Indigenous groups of the Treaty Alliance Against Tar Sands Expansion, Greenpeace is supporting the grassroots movement to stop this and other dirty tar sands pipelines. Alongside Indigenous communities, Greenpeace supported individuals who took a series of actions over eight days to peacefully block the entrance to a Kinder Morgan construction site in Coast Salish territory near Vancouver, Canada. The bold action delayed the construction of the tar sands oil pipeline that would violate Indigenous rights and threaten clean water for thousands of people. More than 200 people were arrested during the peaceful blockade, including Indigenous land defenders, students, grandmothers, doctors, nurses, teachers—and even a former pipeline engineer. But the blockade was just one in a series of powerful and inspiring acts of courage opposing Kinder Morgan’s destructive pipeline. More than 10,000 people joined the Indigenous-led “Protect the Inlet” mass mobilization in Vancouver against the company’s Trans Mountain Pipeline expansion and sent a clear message of resistance to the oil industry. While Kinder Morgan stopped short of announcing it is outright canceling the project, this is a huge victory for Indigenous rights, our communities, and climate. And it energizes our campaign to stop other dirty, dangerous pipelines. Because despite the proven threats, oil companies still want to build more and more pipelines through other people’s homes. But those projects won’t get anywhere without funding. Greenpeace is putting U.S. banks, like JPMorgan Chase, on notice: They must not provide loans or other financial services to fund oil companies and their destructive pipeline projects. 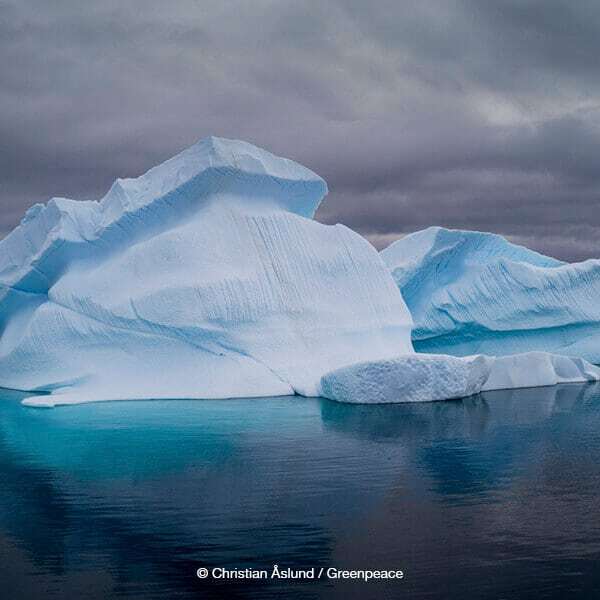 Ask the international body tasked with the protection of the world’s last remaining pristine marine ecosystem to create an Antarctic Ocean Sanctuary! 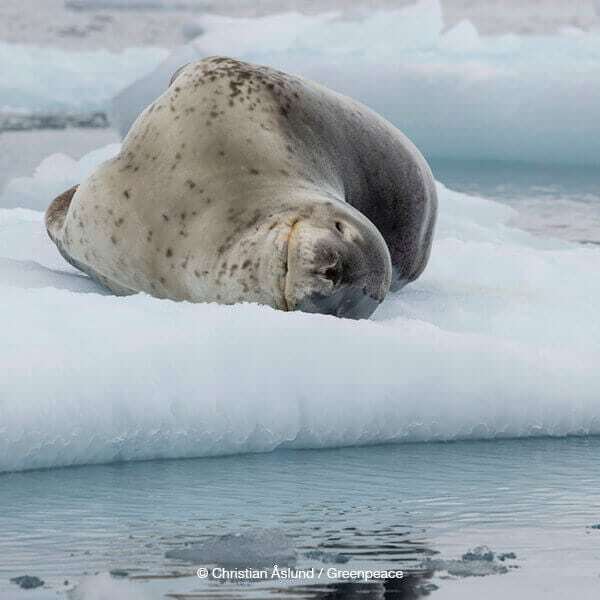 The Commission for Conservation of Antarctic Marine Living Resources has the opportunity to make history when it convenes this October by designating 695,000 square miles in the Weddell Sea as the largest marine protected area on Earth. An Antarctic Ocean Sanctuary would be a safe haven for penguins, whales, and seals, putting the waters off-limits to the industrial fishing vessels sucking up the tiny shrimp-like krill Antarctic life relies on. 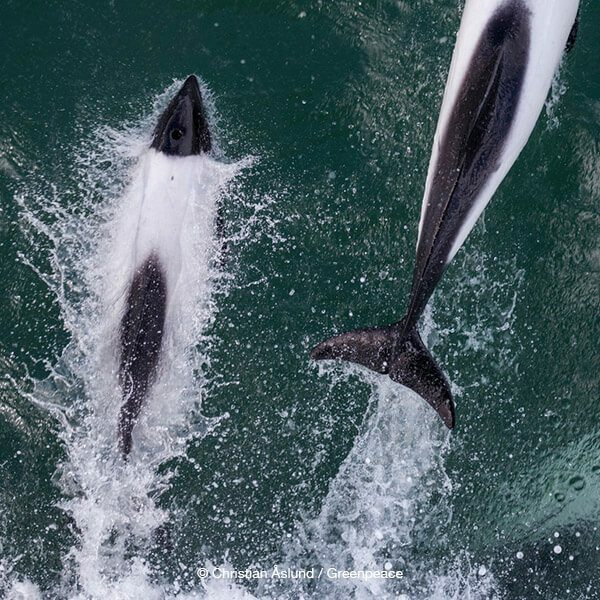 No business is worth sacrificing a whole ecosystem for, and world leaders shouldn’t allow an ocean wilderness to be exploited by a handful of companies. Cut pipelines off at the source—tell JPMorgan Chase to stop funding pipelines! Tell JPMorgan Chase to stop funding new tar sands pipelines, like Keystone XL, and other dirty fossil fuel pipeline projects. Stand up for our environment, Indigenous rights, and our climate here: greenpeace.org/usa/stoppipelines. Our oceans are not a dump—demand corporations take responsibility for the plastic pollution crisis and end the use of destructive single-use plastics and packaging. You can also help by using Greenpeace’s Plastic Clean-Up & Brand Audit Toolkit at greenpeace.org/usa/plasticstoolkit to take action in your community. Refuse plastic whenever possible. Carry your own reusable bags, bottles, cups, mugs, utensils, etc. Buy only loose fruits and vegetables, not produce wrapped in plastic. Choose paper over plastic if you forget to bring your own bags to the store. And talk trash with your friends, family, and colleagues to heighten awareness of the plastics epidemic, urging them to do their part, too—beginning with demanding that big corporations producing all this pollution phase out single-use plastics. 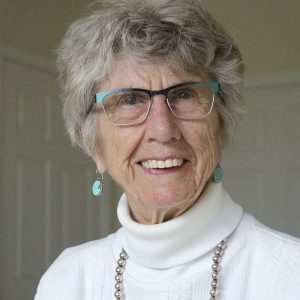 Martha Vinick has been fighting for change for 50 years. With a gift in her will, she’ll help Greenpeace continue the fight for the next 50 years.